With a fresh perspective and compelling characters, FOUR SECRETS explores the powerful dynamics of friendship and loyalty between three bullied teens before, during, and after they decide to take matters into their own hands and stand up to their tormenters. 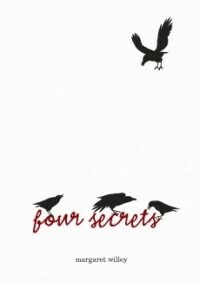 I seem to be very interested in books about “secrets” this year. This happens to be the third book I’ve read with the word “secret” in the title, and yet another that was a thrilling page-turner because of my insatiable desire to uncover the various secrets hidden by each of the characters. The cover was no minor pull either—a stark white background topped with a gathering of four black crows—and the story did not fail to fully engage me. I can guarantee it will not disappoint you. Written from several points-of-view, Four Secrets opens with the journal of Katie Havenga, an eighth-grade teenager just entering juvenile hall because of a crime she and her two best friends, Renata and Nate, allegedly committed against the school’s biggest bully, Chase Dobson. Given this journal by her case worker in order to help her pull together the truth, Katie begins to tell about the events leading up to their crime and the reasons behind it. Her dearest friends Nate and Renata, also in juvie, are given journals to write in as well, and interspersed between Renata’s engrossing drawings (she doesn’t write) and Nate’s fantastical prose are glimpses of the world of juvenile delinquent social worker, Greta Shields. Renata asks for a sketchbook instead of a journal, and begins to hash out through her art the torment she has been experiencing leading up to the case. Nate’s writing expresses his devotion to his friends, whom he calls his “true sisters”, in a way that causes the case worker to admire their friendship and begin to understand the pact they have established between themselves. In spite of Katie’s hiding her ‘real’ journal--where she pours out her soul and rehashes several conversations from the past--and finding another in which to write fake entries, Greta begins to piece together the secrets both uniting and imprisoning these three friends who wanted to do something drastic to stop a bully. And Chase Dobson is your classic bully. Although all of these kids speak in a style much “older” than a typical 8th grader would have when I was in school, and in general, seem older (it was hard for me to picture Chase Dobson really being that big at such a young age for a boy, or Katie having as much insight as she did, for example), as the stories came together I could see clear as day the situations and the types of people these kids encountered. And as an unpopular and picked-on kid myself, the desperation and frustration these kids experienced was right on. It is hard to believe that an adult could create and write in such rich, flowing, teenage language about experiences that are so far removed from her adult life. It is true that there is not much this day and age that teachers and those in authority do about bullying, and they haven’t in the past. I can still remember when kids picked on me or others and I “tattled” on them, and how parents and teachers alike just brushed it off as “something kids do.” This is clearly the wrong response, and this story brings the seriousness of the lack of response to the forefront. What is the pull of this story? The writer’s ability to tap directly into the deep well of teenage angst, via personal journals. Willey manages to incorporate through her account the longing for approval and acceptance; the overwhelming desire for true friendship; frustration at parents who are withdrawn, absent, or overprotective; anger at injustice and need to make things right; and the need for a mentor, a person who really cares and won’t make judgments but accepts you for who you are and encourages you to be more than you are. Every one of these elements is evident throughout the book—and even show up within the bully. As Greta becomes more and more obsessed with solving the mystery of what really happened, she also becomes the exact person each one of these bullied kids needs. I myself was fully absorbed, wondering “what really happened?” The answers turn out to be both tragic and enlightening. I could not put this down.